The varying sizes of S Orionis compared to the inner Solar System. The red giant pulsates from the yellow disk out to the inner red disk. In 5 billion years the Sun will evolve to this stage before cooling down as a white dwarf. All the distances are to scale, while the diameters of the Sun, planets and maser spots (in red and green) are not. 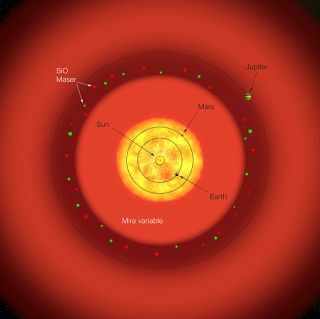 Using thelargest telescopes available, astronomers have dissected the dusty, gassy layersof the red giant S Orionis--a star that pulsates in size from a diameter roughlyequal to the orbit of Mars to halfway between Mars and Jupiter every 410 days. Theinformation provides a glimpse at the futureof our own sun, which will puff into a red giant like S Orionis in about 5billion years, said astronomer David Boboltz of the U.S. Naval Observatory. "No studyof a red giant has been done to this level, looking at infrared and radio-waveviews simultaneously," Boboltz said. "This really show us where the layersare." Redgiants are older versions of the sun that, once they have burned off mostof their hydrogen fuel, begin to burn helium. This creates intense "flashes" ofradiation that puff the star up to more than 100 times its original size as itpushes stellar gas and dust out into space. S Orionis sheds about the mass ofEarth each year. "A lot ofmaterial escapes from the star's gravity, and begins to form beautiful planetarynebulas," Boboltz said. "But gravity overcomes a lot of gas and dust thatgets pulled back into the star, starting the cycle all over again and forming akind of pulse." Where thoselayers are located and exactly what they're made of, however, was a mysteryuntil Boboltz and his colleagues' investigation, which is detailed in a July issueof the journal Astronomy & Astrophysics. The teammeasured the shells of gas and dust surrounding the star to most detailed levelto date, discovering that the star's dusty shell of corundum--a compound used insandpaper--was twice as large as previously thought. They also showed dustycorundum mixing heavily with gaseous silicon monoxide, a compoundastrophysicists thought existed as a dust outside of red giants. "We'veessentially mapped the envelopes of material around these stars, which hasnever really been done before," Boboltz said. Theresearchers aimed two of Earth's biggest interferometertelescopes at the star to peer at its layers: the Very Long Baseline Array(VLBA), a series of 10 telescopes spread over 5,350 miles that can see radiowaves, and the infrared-seeing Very Large Telescope Interferometer (VLTI) in Chile. If thetelescopes were in New York, Boboltz noted, they would allow someone to read anewspaper in California. But regular sources of radio and infrared waves wouldmake S Orionis look more like "a blob of emissions," so his team recorded its "masers,"or naturally occurring lasers. Astrophysicistsaren't entirely sure how they form, but the basic principles of a laser apply:Some process evenly energizes one kind of molecule to produce a "synchronized"wave of light. "Stuff likecorundum and silicon monoxide, which we detected in S Orionis, emit their ownunique masers," Boboltz said. By watching the masers move over the period of afew months, they recorded an extremely detailed picture of the red giant'spulsating behavior. A videoexists of another pulsating red giant star, call TX Cam, but Boboltzexpects to surpass it's a visualization of only radio images. "Soon we'llbe able to create even better views of the pulsating cocoon around S Orionis by looking at water masers," Boboltz said, which exist at the farthest reaches ofthe cocoon. "We also hope to explain how a planetarynebula forms from a red giant near the end of its life as a whitedwarf star."